Novel covalent porphyrin and its complexes (Co2+, Zn2+) functionalized multi-walled carbon nanotubes (MWNTs) have been successfully synthesized by the reaction of the carboxyl on the surface of MWNTs which was synthesized to use carbon radicals generated by the thermal decomposition of azodiisobutyronitrile (AIBN) with 5-p-hydroxyphenyl-10,15,20-triphenyl-porphyrin and its complexes (Co2+, Zn2+). Three resulting nanohybrids were characterized by spectroscopy (FT-IR, Raman, and UV-vis), TGA, and TEM. The quality of porphyrin attached to the MWNTs was determined from thermogravimeric analysis (TGA) of the MWNTs, which showed a weight loss of about 60%. The Raman and absorption spectroscopy data showed that the electronic properties of modified MWNTs were mostly retained, without damaging their one-dimensional electronic properties. From fluorescence measurements, it was observed that the porphyrin and its complexes (Co2+, Zn2+) were nearly quenched by MWNTs, indicating that this covalently modified mode facilitated the effective energy or electron transfer between the excited porphyrin moiety and the extended π-system of MWNTs. 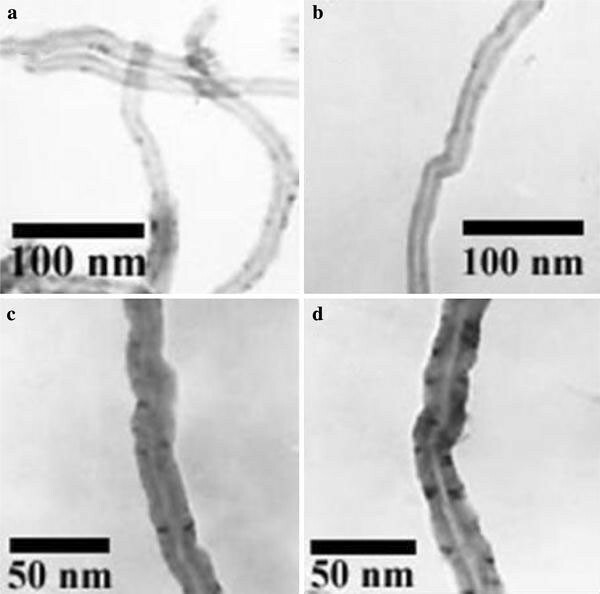 Carbon nanotubes (CNTs) have been investigated extensively because of their unique materials properties . Various potential application of these properties, including those in electronic and optoelectronic devices, chemical, and biochemical sensors, have been widely discussed [2–10]. Porphyrins are stable natural functional dyes that have extinction coefficient in the visible light region, predictable rigid structures, and prospective photochemical electron and energy transfer ability, and have been widely studied for various photoharvesting and photoelectronic devices [11, 12]. In the last 4 years since Nakashima et al. reported the first porphyrin-nanotube nanocomposite formed by van der Waals forces, several non-covalent systems have been investigated as CNT-porphyrin hybrid materials for various molecular photoelectronic applications; these have been constructed using π–π and van der Waals interactions [13–17], polymer wrapping [18, 19], and electrostatic interactions [20–25]. However, studies of the covalent incorporation of light-harvesting porphyrin chromophores with the extended π-system of CNTs have been limited. Recently, Ya-Ping Sun et al. and Durairaj Baskaran et al. [26, 27] have reported porphyrin-functionalized CNTs bound covalently with an ester linkage, in which CNTs bearing carboxylic groups on the sidewall and at the terminal were esterified with hydroxyl porphyrins. More recently, Zhen et al. have reported the synthesis of a novel covalently porphyrin-functionalized single walled carbon nanotube nanohybrid constructed with a unique direct linkage using in situ generated diazonium compounds. However, there are two disadvantages in porphyrin-functionalized CNTs process, one is the low quantity porphyrin (<20 wt%) grafted to the surface of CNTs, another is that the structure of CNTs was badly destroyed because carboxyl groups on MWNT surface are prepared by strong oxidative acid treatment. To the best of our knowledge, there have been few reports on the functionalization of CNTs to overcome these two weaknesses simultaneously. This paper reports a novel covalent porphyrin and its complexes (Co2+, Zn2+) functionalized by MWNTs. They were successfully synthesized by the reaction of the carboxyl on the surface of MWNTs which was synthesized to use carbon radicals generated by the thermal decomposition of azodiisobutyronitrile (AIBN) with 5-p-hydroxyphenyl-10,15,20-triphenyl-porphyrin and its complexes (Co2+, Zn2+). The quality of porphyrin attached to the MWNTs was determined from thermogravimetric analysis (TGA) of the MWNTs, which showed a weight loss of about 60%. The Raman and absorption spectroscopy data showed that the electronic properties of modified MWNTs was mostly retained, without damaging their one-dimensional electronic properties. From fluorescence measurements, it was observed that the porphyrin and its complexes (Co2+, Zn2+) were almost quenched by MWNTs, indicating that this covalently modified mode facilitated the effective energy or electron transfer between the excited porphyrin moiety and the extended π-system of MWNTs. The strategy was devised as presented in Scheme 1. The resulting nanohybrids were characterized by transmission electron microscopy (TEM, Hitachi H-600, 10 kV), Fourier transform infrared (FTIR) spectrometry (FTS 7000 Series), Raman spectrometry (Raman, Bruker RFS100/s), UV-Vis spectrometry (Varian CARY50), Thermo gravimetric analysis (TGA, PE-7), and fluorescent spectrometry (Hitachi F-4500). Samples for TEM were prepared by the dispersion of material in methanol with the help of an ultrasonic bath. TGA analyses were preformed in air flow with a heating rate of 10 °C/min. Samples for characterization with the UV-visible spectrometer were dispersed in chloroform with the help of an ultrasonic bath. MWNTs generated via chemical vapor deposition (CVD) method were purchased from Shenzhen nanoport (Shenzhen, China, purity >90%). Other reagents including Fe(NO3)3 · 9H2O, AIBN, toluene, sodium hydroxide, methanol, hydrochloric acid, toluene, pyrrole, propanonic acid,p-hydroxybenzaldehyde, benzaldehyde, chloroform, thionyl chloride, acetic acid, triethylamine, tetrahydrofuran, cobalt acetate, and zinc acetate were AR grade and were used as supplied. According to the literature , 180 mg MWNTs were dispersed in 180 mL toluene by stirring for 30 min. Then, under continuous stirring, 36 mL toluene solution containing 11.52 g AIBN was added to the dispersion. 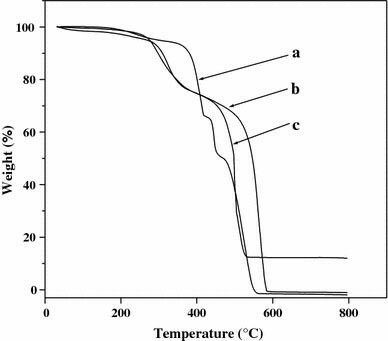 Subsequently, in an Ar atmosphere, the resulting dispersion was heated at 75 °C for 4 h. The product was washed with toluene repeatedly and dried in vacuum at 40 °C overnight, thus, MWNTs-cyano (MWNTs-CH2CN) were produced. A total of 100 mg MWNTs-CH2CN were dispersed in a mixture of methanol and 10 M sodium hydroxide; and the resulting materials were subjected to refluxing at 60 °C for 48 h. The product was washed with distilled water for several times. Finally, the purified MWNTs-CH2COONa was dried in vacuum at 40 °C overnight. The materials were washed with 2 M hydrochloric acid, resulting in MWNTs-CH2COOH. Thep-hydroxybenzaldehyde (3.0744 g, 0.0252 mol) and benzaldehyde (8.0242 g, 0.0757 mol) were added to 300 mL of propionic acid. The temperature was maintained between 124 and 126 °C, and pyrrole (6.78 g, 0.101 mol) was slowly added. After the reaction mixture was refluxed for 40 min and cooled, 200 mL of propionic acid was removed by distillation under vacuum (10 mmHg). Then, 100 mL absolute ethanol was added to the reaction mixture, and this was stored overnight in a freezer at 5 °C, and then the purple precipitation was filtered off and washed with a minimal amount of methanol and dried. Further, purification was carried out by dissolving this material in a minimal amount of chloroform, and this solution was separated on a chromatographic column of neutral alumina using chloroform as the eluent. The first pink band contains 5,10,15,20-tetra(phenyl)porphyrin. The third band, which moved very slowly, contained muti-hydroxyporphyrin. The second band which contained the target material (MHTPP) was collected and was dried under vacuum on a rotary evaporator. Then, this material was redissolved in reagent grade chloroform and separated on a chromatographic column of silica gel using chloroform as the eluent. Finally, the second purple band was collected and dried under vaccum on rotary evaporator and later dried in a vacuum, to obtain a yield of 1.73 g (8.3%). To obtain the CoMTPP, MHTPP (0.126 g, 0.2 mmol) was added to DMF (50 mL) and the mixture was stirred until the porphyrin dissolved before adding Co(OAc)2(0.107 g, 0.6 mmol). The resulting reaction mixture was refluxed for half an hour and cooled, and 100 mL of chilled, distilled water was added. Finally, the purple solid was filtered, washed with water, and dried under vacuum to obtain the CoMTPP. ZnMTPP was prepared by following the similar procedures. To prepare covalently grafted porphyrins and its complexes to MWNTs , MWNTs-CH2COOH was used to attach a functional MHTPP. First, MWNTs-CH2COOH treated with thionyl chloride was reacted with excess MHTPP in toluene in the presence of triethylamine at 100 °C for 24 h under a pure nitrogen atmosphere. To remove the unreacted MHTPP, the tubes were washed thoroughly with a plenty of methanol, followed by a small amount of acetic acid and triethylamine, and finally with tetrahydrofuran (THF), resulting in the composite I. The composite I was then dried at 40 °C for 5 h under vacuum. The composite II and the composite III were prepared by following the similar procedures. Initial insight into the formation of the composites (I–III) came from TEM. Pristine MWNTs was treated with acid to remove the metallic nanoparticles (Fig. 1a). Reference images of MWNTs after MHTPP, CoMTPP, and ZnMTPP grafted became darker wall of MWNTs in Fig. 1b–d, respectively. 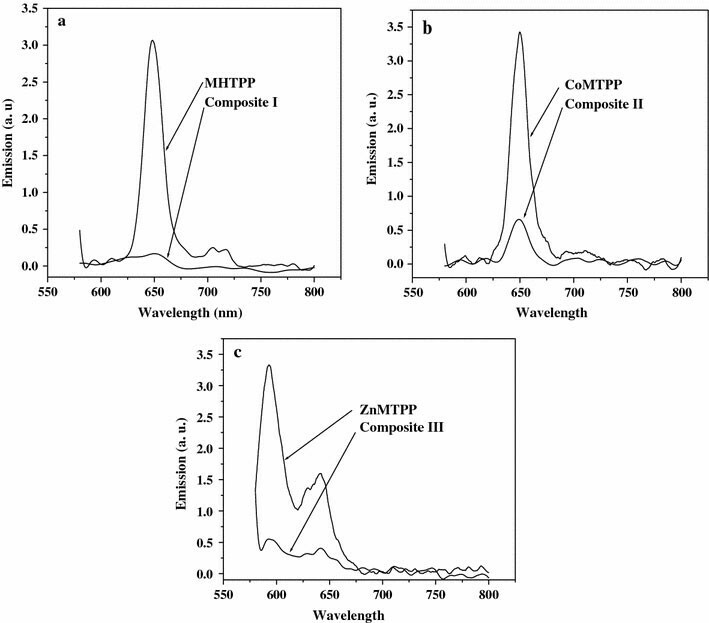 The corresponding TEM micrographs show darker areas surrounding the nanotubes walls corresponding to MHTPP, CoMTPP, and ZnMTPP. The FT-IR spectrum of the composites (I–III) showed characteristic vibrations of the groups of pyrrole, benzene, and methylene centered at about 1205, 1566, and 2852 cm−1, respectively (Fig. 2). Therefore, all of the MHTPP, CoMTPP, and ZnMTPP covalently linked MWNTs system have been confirmed by FT-IR. The quantity of porphyrin linked to the MWNTs surface was determined by TGA. The weight loss of the porphyrin on composite I from 183 °C to 570 °C is about 60%, with a major weight loss at 487 °C (Fig. 3). 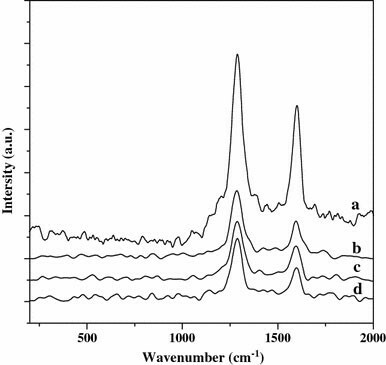 Figure 4 showed the Raman spectra (200–2000 cm−1) of raw MWNTs and composites (I–III). Spectra were normalized to the intensity of the D-band (1287 cm−1). The effect of functionalization lowered the ratio of intensities of G- and D-bands in the spectra of the composites (I–III) compared with raw MWNTs. This showed that the electronic properties of modified MWNTs were mostly retained, without damaging their one-dimensional electronic properties. 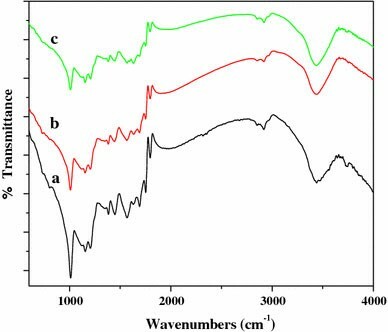 The lowered ratio in intensities between the two bands of the composites (I–III) can be interpreted as an indication of an increased number of sp3 hybridized carbon atoms in the composites (I–III) . As shown from UV-vis spectra in Fig. 5, the number of peaks of CoMTPP and ZnMTPP compared with that of MHTPP were decreased when Co(II) or Zn(II) ion inserted into the porphyrin ring, because the porphyrin ring belongs to D2hpoint group and the metalloporphyrin ring belongs to D4hpoint. The UV-vis absorption in chloroform showed a broad signal monotonically decreasing from 300 to 900 nm and a Soret band at 425 nm corresponding to MWNTs and porphyrin, respectively. 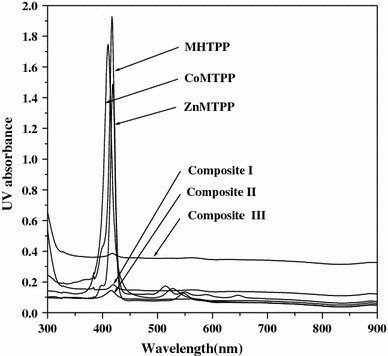 Interestingly, the absorption of surface-grafted porphyrin and the complexes had a distinct shift (∆λmax = 8 nm) as compared to that of the MHTPP, CoMTPP, and ZnMTPP. In the case of composite I, II, and III samples, only the Soret band was seen at 425 nm due to the overwhelmingly broad absorption of MWNTs. Covalently connected porphyrins on carbon nanotubes can be used as energy transporting antennae. From Fig. 6 and Table 1, we can observe the solution of the composite I 95–100% quenching of emission bands at 650 nm and 725 nm on excitation at 550 nm, as compared to that of MHTPP at a matching absorption and the solution of composite II 81–100% quenching of emission bands and the composite III 74–85% quenching of emission bands. Excitation at different wavelengths (420 nm and 520 nm) also showed similar quenching, supporting the presence of an electron or energy transfer process [13, 31]. The electron or energy transfer from singlet excited porphyrins to carbon nanotubes takes place only when the porphyrins are linked covalently, as evidenced by a substantial emission quenching. This reveals that covalently connected porphyrins act as energy absorbing and electron transferring antennae, and the carbon nanotubes act as electron or energy acceptors. In conclusion, unlike those produce with strong oxidative acid treatment, carboxyl groups on MWNT surface prepared by the thermal decomposition of azodiisobutyronitrile (AIBN) retained most of their electronic properties, without damaging their one-dimensional electronic properties and all of carboxyl groups were on the MWNT sidewall. The quantity of porphyrin with covalently linked MWNT surface synthesized by this method reaches about 60 wt%. The absorption and fluorescence of these nanohybrids show that the carbon nanotubes serve as an efficient electron or energy acceptor and pave the way to construct novel photovoltaic devices and light-harvesting systems using various porphyrin-functionalized carbon nanotubes. We thank Dr. B. D. Wang of College of Chemistry and Chemical Engineering at Lanzhou University for his hearty assistance in acquiring fluorescent data.